Best view unit, 6th floor views, upscale artistic decor. See reviews. Unbelievable beach and ocean views from Makena to Maalaea in this newly remodeled artistic upscale 6th floor apartment. Expensive furnishings. One bedroom, one bath condo with a private covered lanai (balcony). New central split AC for all rooms. ( Our apartment is one of the few in resort that has AC in the bedroom which otherwise can get hot, especially from March-November) Watch the whales breach (jump) from the lanai. The tastefully designer-appointed condo features new granite counter tops, new furniture, and original art. Just a 30 second walk to world famous Charley Young Beach. Best view unit in complex. Sleeps 2. 5 day minimum. Not your average used rattan furnished unit. This one stands out. The owners of Kamaole Beach Royale #608 also own Maui's premiere wedding company. They coordinate over 500 weddings and vow renewals each year on Maui since 1994. ( Over 7000 to date) The apartment is their 'baby' and they are proud to feature it, as it is beautiful for honeymooners or vacationers. Please See reviews at vrbo 423761. The oceanview rooftop is available for anyone's use - bar-b-que, picnic. The views are fantastic. There is ample parking, and walking distance to restaurants, and the beach is so so close! The apartment's 6th floor view is unique to Maui as the vast majority of the buildings don't have such a height. High thread count linens. Duluxe! Nice oven with 4 burner stove top. Everything you could want except food. There is a cool healthy-type grocery a block away. All and more than you need and will use. New and fully stocked with everything you need to cook and dine. There is nothing you need to buy except food and essentials..
Cable TV with many many channels. Free Wi-Fi. This condo has a phenominal ocean view. Most nights, we enjoyed spectacular sunsets on the Lanai while enjoying a nice glass of wine, cheese and crackers. Additionally, the central location makes this condo a perfect place to stay. Condo was centrally located which was great, lots of shops and restaurants around, all within walking distance. Great beach to sit on and swim in, just 1 block down and wonderful sunset view's each night from the balcony. We didn't use the air conditioning, as the breeze through the balcony and bedroom windows was enough to keep the condo cool both day and night. Only thing with the windows being open is you get an early wake up call from the birds and garbage men starting their very early routines!!! This just gives you more time to watch the whales and walk the beaches with an early start. We would definitley stay at this Condo again. We have booked this unit for several years and are looking forward to 2020. Love the view, the decor and the owners who are always making sure the guests have everything needed to enjoy lovely island magic! This property was perfect for us! My husband and I enjoyed our honeymoon more than we could have imagined! Perfect location, central to everything- shopping, food, beaches!! Clean and comfy living space, room to cook breakfast and enjoy it on the balcony!!! Looking forward to coming back some day! Thanks for the nice comments. Yes, the panoramic ocean view is one of the the best at Kamaole Beach Resort. The cool remodeled kitchen does has everything you need to make breakfast or dinner, so you don't always have to go out and eat if you don't want. Please visit Paradise again. Newly renovated with upscale materials made it feel very very comfortable. Fantastic ocean view, breakfast on the Lanai was real treat. Centrally located in kihei only 1/2 block from beach. But still recommend having a car rental to see more if the island. Only issue was the a/c in bedroom, was really really noisy in middle of the night. However the repair company was on the door step when we we were checking out of the condo to replace the faulty unit. All in all, highly recommend this rental. Thanks for the nice review. We do recommend everyone rents a car. The resort offers free parking and one must drive to see our unbelievable waterfalls; hiking in the mountains, driving to the top of the volcano ( it looks like the planet Mars 😄The ac is brand new, split system . Of of the few apartments in the Resort with Ac in the bedroom . I am glad the Ac compmay came out the next morning after you notified us. Everything we hoped for!!! Definitely booking again. 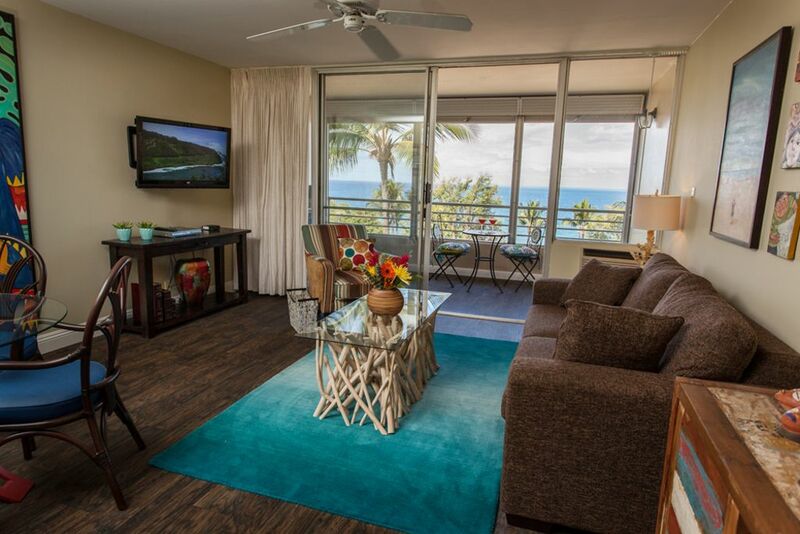 Kamaole Beach Royale on the 6th floor offers a totally remodeled upscale apartment with fantastic ocean and beach views. Charley Young Beach is a 30 second walk and is world-famous for its beauty. Oceanview photos are from actual unit, not from rooftop like others. Watch amazing sunsets. Located 25 minutes from airport. 1.5 hours form Haleakala Crater. 2.5 hours from Hana. One of the best apartments on Maui! NO INFLATED TAX RATE. AGAIN, NO SECURITY FEE REQUIRED. NO HIDDEN FEES. Cancellation at any time will incur VRBO"S credit card charge of $30.00. Cleaning fee $70.00.